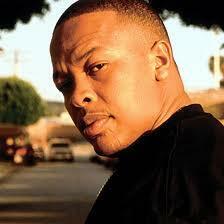 Dr. Dre needs no introduction. Despite the perpetual delay of his borderline mythical album Detox, he legacy and influence in the rap game will resound until the genre’s extinction. He’s a pioneer and forefather who brought G-gunk and/or gangster rap to international attention in the late 80s and early 90s, and again at the end of the 20th century. Throughout his prolific 30-year career, the founder/CEO of Aftermath Entertainment and Beats Electronics has collaborated with his NWA group mates Ice Cube, Eazy-E, DJ Yella and MC Ren, as well as Kendrick Lamar, Rick Ross, Jay Z, T.I., The Game, Snoop Dogg, Eminem, Jay Z, 50 Cent, Timbaland, Missy Elliot, Justin Timberlake, D’Angelo, Rakim, Nate Dogg, Xzibit, Devin The Dude, Nine Inch Nails, Kurupt, Nas and countless others. Most recently, he signed Jon Connor to Aftermath, claimed he doesn’t listen to his music after it drops and has been dealing with alleged mistress woes. Also, he’s currently preparing to launch his new Beats Music streaming service with Jimmy Iovine. Stay tuned. Dre's middle name, Romelle, was inspired by his father's amateur R&B group The Romells. At the age of seventeen, he had a son named Curtis with Lisa Johnson, who became a rapper by the name of Hood Surgeon. Dre attended Vanguard Junior High School, Roosevelt Junior High School, Centennial High School and Fremont High School. Dre is currently valued at approximately $270 million. Warren G is his stepbrother.